Just after dawn, Caren walks the grounds of Belle Vie, the historic plantation house in Louisiana that she has managed for the past four years. Today she sees nothing unusual, apart from some ground that has been dug up by the fence bordering the sugar cane fields. Assuming an animal has been out after dark, she asks the gardener to tidy it up. Not long afterwards, he calls her to say it's something else. Something terrible. At a distance, Caren missed her. The body, the dirt and the blood. 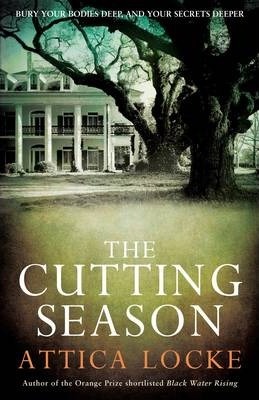 A magnificent, sweeping story of the south, The Cutting Season brings history face-to-face with modern America. Attica Locke once again provides an unblinking commentary on politics, race, the law, family and love, all within a thriller every bit as gripping and tragic as her first novel, Black Water Rising. Attica Locke's first novel, Black Water Rising, was shortlisted for the Orange Prize, nominated for an Edgar Award, an NAACP Image Award and a Los Angeles Times Book Prize. Attica is also a screenwriter who has written for Paramount, Warner Bros, Disney, Twentieth Century Fox, Jerry Bruckheimer Films, HBO, Dreamworks and Silver Pictures. She was a fellow at the Sundance Institute's Feature Filmmakers Lab and is a graduate of Northwestern University. A native of Houston, Texas, Attica lives in Los Angeles, with her husband and daughter.